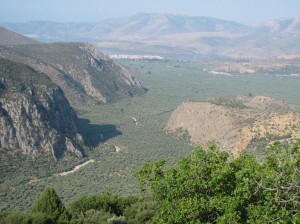 The view from Delphi down to the sea. Most people go to Delphi to visit the archeological ruins. 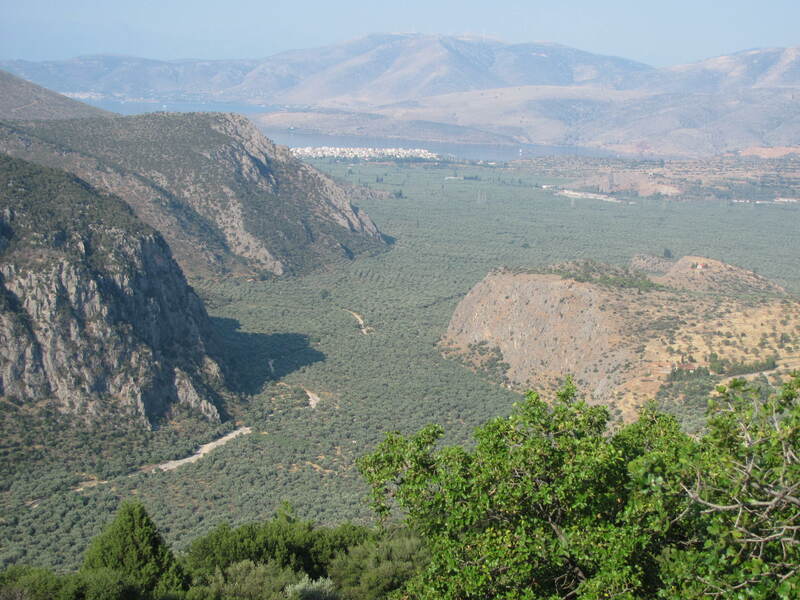 Having seen these multiple times, I decided to experience the ancient world of Greece a different way—by hiking the ancient pilgrims’ path from Delphi down to the ancient port of Kirra. I suppose it might have been more pilgrim-like to do the hike from the sea up the mountainside to Delphi, which is the path that hopeful Apollo worshipers would have taken on their way to consult the Oracle. 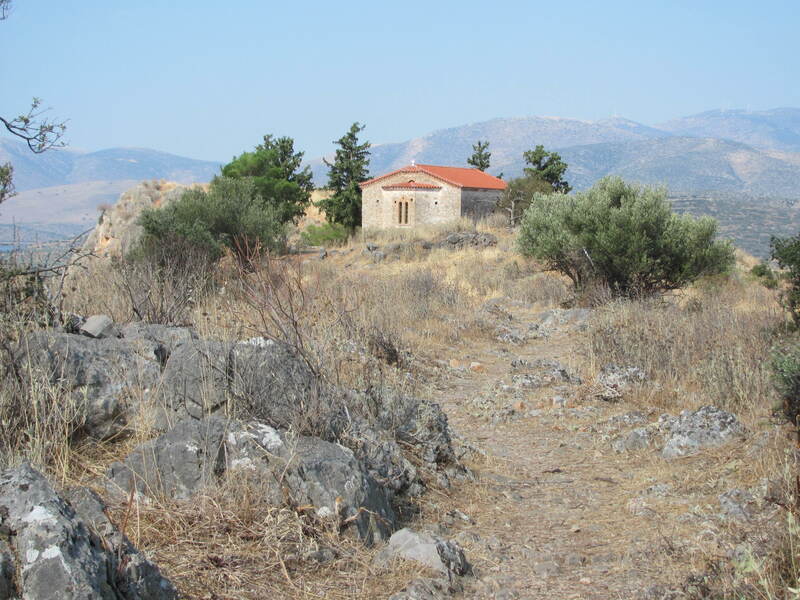 But since I don’t need any answers from the Oracle, nor am I on my way to worship Apollo, I thought it was pilgrim-like enough in the July heat to do the downhill route. The start of the hike was clearly marked from Delphi town’s main street, leading through people’s back yards where they’d tried to hide discarded, broken furniture and other miscellaneous things from the casual passer-by. But I’d soon descended beyond the homes onto the ancient road that those seeking wisdom from the Oracle would have taken. I found that an ancient paved road has a lot in common with the rocky never-paved forest trails of my native Pacific Northwest mountains. I picked my way carefully though the broken rocks, wondering how the ancients in their leather sandals could have negotiated this road, even in its paved state, when my rubber-soled shoes slid over the slick stones. The trail was lonelier than I’d expected, the only signs of life goat droppings and an occasional distant rooster call. Finally, even those faded away, and I was surrounded by just the incessant, frantic clatter of cicadas in the heat. I loved running across small churches along my trail. The trail touched on civilization briefly, taking me through the edge of the town of Chrissa, but then I plunged back into the stony and desolate hills, heading down, down, down, dropping 1500 feet to the sea. I might have been worried that I would lose my way out there all alone, but the trail was surprisingly well marked—much better marked than the typical Greek highway. And there were delightful surprises along the way. I’ve never run into a Byzantine church while hiking in the Northwest, but this trail had two, though both were locked. When I reached the olive trees (which, incidentally, make up the largest continuous olive grove in the world), I knew I was on the home stretch. I kept to the edge of the trail, making the most of every patch of shade. When I saw the first building that looked like someone might actually live in it, I allowed myself to start thinking of a cold beer at trail’s end. But the trail plunged back into the olive grove, and I continued on without sight of humans and now thirsting for that beer. But at last, I reached the main road and cars whizzing by, a bit of a shock after the remoteness of the stony hillside and the olive trees. Through the small town and I was at the sea. Ancient pilgrims may have faced the sea with mixed emotions, depending on what the Oracle had revealed to them. But I was satisfied. I’d reached my goal—the sea. A cold beer and the bus back to Delphi awaited me in the neighboring town of Itea. I picked up my pace.